This book contains theoretical and application-oriented methods to treat models of dynamical systems involving non-smooth nonlinearities. The theoretical approach that has been retained and underlined in this work is associated with differential inclusions of mainly finite dimensional dynamical systems and the introduction of maximal monotone operators (graphs) in order to describe models of impact or friction. The authors of this book master the mathematical, numerical and modeling tools in a particular way so that they can propose all aspects of the approach, in both a deterministic and stochastic context, in order to describe real stresses exerted on physical systems. Such tools are very powerful for providing reference numerical approximations of the models. Such an approach is still not very popular nevertheless, even though it could be very useful for many models of numerous fields (e.g. mechanics, vibrations, etc.). 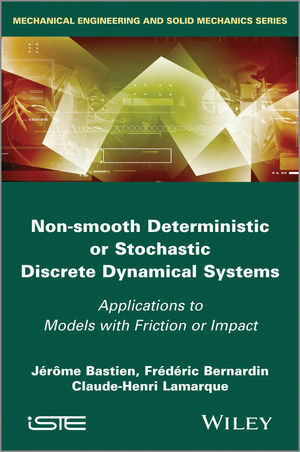 This book is especially suited for people both in research and industry interested in the modeling and numerical simulation of discrete mechanical systems with friction or impact phenomena occurring in the presence of classical (linear elastic) or non-classical constitutive laws (delay, memory effects, etc.). It aims to close the gap between highly specialized mathematical literature and engineering applications, as well as to also give tools in the framework of non-smooth stochastic differential systems: thus, applications involving stochastic excitations (earthquakes, road surfaces, wind models etc.) are considered. Jérôme Bastien is Assistant Professor at the University Lyon 1 (Centre de recherche et d'Innovation sur le sport) in France. Frédéric Bernardin is a Research Engineer at Département Laboratoire de Clermont-Ferrand (DLCF), Centre d'Etudes Techniques de l'Equipement (CETE), Lyon, France. Claude-Henri Lamarque is Head of Laboratoire Géomatériaux et Génie Civil (LGCB) and Professor at Ecole des Travaux Publics de l'Etat (ENTPE), Vaulx-en-Velin, France. Claude-Henri LAMARQUE, Head of LGCB, Professor ENTPE, Vaulx-en-Velin, France. Jérôme BASTINE, Assistant Professor at the University Lyon 1, Lyon, France. Frédéric BERNARDIN, Research Engineer at CETE de Lyon (DLCF), Lyon, France.